The military situation that greeted General Washington at Cambridge in July 1775 might well have given him pause. To be sure, the strategic realities favored the Americans in drawn-out military operations. With the militia firmly controlled by the Patriots, and with Committees of Correspondence and other extralegal bodies acting effectively in place of the old colonial governments, the British faced armed and organized opposition in each colony. Reestablishing Royal control, either through occupation or intimidation of a vast and hostile region stretching from New England to Georgia, presented formidable, if not insurmountable, difficulties. Only fools would ignore Britain's military might, based on a large and professional army, vast wealth that permitted hiring of foreign auxiliaries, and the world's largest navy, which guaranteed control of the seas. These obvious advantages prompted most politicians and military leaders in London, along with their Loyalist supporters in America, to predict a speedy Redcoat victory over the "upstart rabble." In so doing, however, they ignored Britain's need to balance offensive operations in North America against its defensive responsibilities in other parts of the globe and the many practical handicaps implicit in communicating with and supplying large forces across 3,000 miles of ocean in the era of sailing vessels. tradition that viewed central authority, even that exercised at the level of individual colonies, with strong suspicion. Their rejection of the concept of a standing army was well known. By European standards, their view of the conduct of military affairs would have been considered naive. They adopted the Continental Army only reluctantly as a minimal response to the presence of Royal troops in their cities and ordered the Army to operate strictly as a defensive force. In the days that followed Lexington and Concord, few delegates contemplated the likelihood of extended military operations; they meant their military initiatives as merely a signal to London that Americans were united in their willingness to defend their rights. To underscore this sense of unity, their resolution that turned the troops in New England into the national Army on 14 June also requested Pennsylvania, Maryland, and Virginia to raise a force of riflemen to serve as light infantry during the siege of Boston. By the same token, they liked to stress as another evidence of unity the fact that the commander appointed to lead the troops in New England was a Virginian. But old fears die slowly, and for every supportive step Congress took in military affairs, the delegates seemed impelled to impose yet another limitation on their commander. While they recognized, for example, the need for an efficient Army led by competent generals, they feared creating another Oliver Cromwell. By adopting units raised by the individual colonies, Congress obtained a sizable body of men in short order, but the result was a haphazard collection of units led by locally appointed commanders selected first for their political reliability and only secondly for their military experience. Congress, moreover, allowed Washington no direct voice in selecting his major subordinates. Although nearly all of the first thirteen generals it appointed were veterans of the French and Indian War, most of these men were also from legislative backgrounds, and sectional balance was a paramount consideration in their choice. Congress left to Washington the task of sorting out the problems attendant on conducting operations with leaders whose politics were above reproach, but whose military competence was not. Furthermore, Congress' fear of standing armies meant that the units of the new Continental Army were enlisted for only limited periods. The men Washington was sent to train and organize into a unified fighting force, those expected to match the British regiments, would be going home at the end of the year when their enlistments ran out. By the end of the summer control over the war had clearly passed from the individual colonies to the Continental Congress. Washington's main contingent adopted a minimum-risk strategy of encircling Boston to keep the largest British force neutralized. 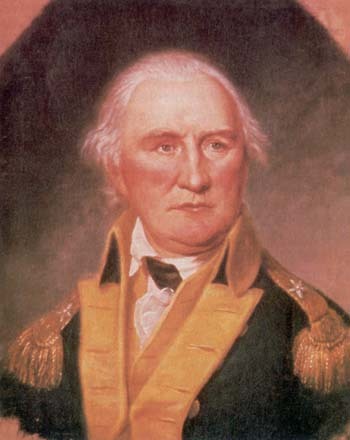 Going beyond purely defensive operations, Washington sent a second field force, under Major General Schuyler, to launch a preemptive invasion of Canada in late fall, hoping to win over that colony to the Revolutionary cause and to prevent the British garrisons stationed there from harassing the frontiers. Despite a series of successes, the campaign ground to a halt in the winter snows when a night attack on Quebec, the last major British strongpoint, was repulsed. At the same time, the enlistments of the 1775 continentals expired on the last day of the year, forcing Washington and the Congress to rebuild the Army. With overall conditions largely unchanged, the Americans followed a similar military policy at the start of 1776, employing a force balanced between short-term militia and Provincial-style units enlisted in the various states for one year's Continental service. The politicians and generals knew that militiamen were most useful in roles compatible with their historic functions: conducting local security, defending their homes from invasion, and providing select groups of men for specific operations of limited duration. Under the supervision of local Committees of Safety, these militia troops prevented the Loyalists (probably about one colonist in ten) from organizing, guarded coastal communities, and kept an eye on Indians along the frontier. Regulars, with more time to train and learn discipline, were needed to fight formal European-style battles, and the continentals, as these troops were now called, appeared capable of carrying out this mission. The only new military initiative in early 1776 was a slight expansion of the Army to include units from all thirteen colonies, plus two from Canada. the military and naval forces stationed in North America to include over 30,000 auxiliaries (the Hessians), whose services were acquired through treaties with various German states. Lord George Germain, who as Secretary of State for America had primary responsibility for devising British strategy, decided to avoid directly challenging Patriot control in New England and to apply resources against especially vulnerable targets. His plan for the campaign of 1776 called for three separate operations. A relatively small expedition under General Sir Henry Clinton would try to regain the southern colonies by rallying Loyalists, who London erroneously presumed were in the majority. Other units would proceed to Canada to turn back the American invasion and to apply pressure on the frontiers of New York and New England. An even larger force would be sent to join Howe, who had evacuated Boston on 17 March. Thus reinforced, Howe would capture New York City and would then use that port as a naval base and as the center of operations to regain control over the middle colonies. By summer, two of the three operations had ended. A combination of militia and continentals defeated the British southern thrust rather easily. Virginia expelled its Royal governor and his small army and fleet. North Carolina crushed a premature uprising by local Loyalists. Finally, an invasion force sent from England was repulsed at Charleston, South Carolina, on 28 June. Again, Patriots misread these early successes. Given the role of Minutemen and militia forces in defeating the governors, their Loyalist supporters, and Indians on the frontier, they came to assume that the militia could carry the major burden of defense. This misjudgment would cost the Americans dearly in later clashes in the south. In the far north, operations ended in a stalemate. The Americans were driven out of Canada in May 1776, but the British had to stop to reorganize their supply lines and to build a fleet on Lake Champlain before they could mount their own offensive. Clearly, the great military test would occur around New York City, where Congress had concentrated about 31,000 men under Washington. Over half were militia and state troops, who had even less training than the main force Washington had rebuilt after Boston. The Americans faced 32,000 British and German regulars under General Howe, supported by a fleet of 73 warships, 370 transports, and 13,000 seamen under his brother, Admiral Sir Richard Howe�the largest transoceanic force ever dispatched before the twentieth century. As battle lines were forming for New York, Congress weighed a momentous decision. Washington's soldiers, facing the realities of the battlefield, had been talking for some time about the need to sever all connections with the Crown. Public opinion had been galvanized by Thomas Paine's stirring call for independence in Common Sense. And now news of the King's declaration that the colonists were in rebellion and of the decision to send Hessians to America finally convinced a majority in Congress that the British government was united in its refusal to make concessions. 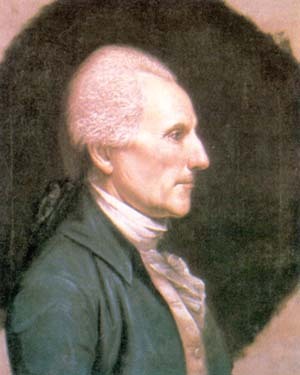 On 7 June Richard Henry Lee introduced a resolution in Congress, drafted by the Virginia Convention, that called upon Congress to declare independence, create a formal national government, and seek foreign allies. The more outspoken Patriots led by John and Samuel Adams of Massachusetts argued that these measures were necessary to win the war. John Dickinson of Pennsylvania and other moderates supported defensive measures required to carry out military operations, but still considered independence premature; they wanted to make one last attempt at a negotiated settlement. Congress decided to appoint two committees: one under Dickinson to develop specific proposals for a confederation of the colonies (now called states) and one under Thomas Jefferson of Virginia to prepare a statement of independence. As chairman, Jefferson wrote most of the draft Declaration. He was assisted by Benjamin Franklin of Pennsylvania, John Adams, Roger Sherman of Connecticut, and Robert R. Livingston of New York. independent nation. Jefferson's elegant words, amended by the other delegates, provided a concise statement of purpose both to the inhabitants of the colonies and to foreign governments. The Declaration also justified independence in terms familiar to Enlightenment philosophers, charging King George with a list of actions that had "broken" the social compact between Americans and the British Crown. Significantly, a third of this list related to military actions, including assertions that "He has kept among us, in Times of Peace, Standing Armies, without the consent of our Legislatures" and that "He has affected to render the Military independent of and superior to the Civil Power." On 9 July Washington assembled his troops and had Congress' Declaration of Independence read to the men to help motivate them for the coming battle. Howe also understood the important interrelationship between military action and political loyalty. He knew that Congress had mobilized large numbers of militiamen to strengthen the continentals, and he reasoned that an overwhelming blow could break the Patriots' current strong will to resist. On 27 August his army badly mauled a large American contingent on Long Island, forcing Washington to undertake a risky night evacuation, and followed it up with a crushing blow on 15 September that captured, New York City. During the next two months, although Washington won a few skirmishes, Howe drove him out of Manhattan Island and the nearby mainland. The American defeat at New York marked a turning point for the Continental Army. Now committed to independence, the Americans had to prepare for a long war to outlast the British, and Washington was able to convince Congress that militia and short-term regulars alone could not meet British and German regulars on equal terms. Since most of the existing enlistments would expire on 31 December, Congress used that opportunity to draft its first comprehensive military program. Central to its new approach were the recruitment of men for the duration of the war rather than for the customary single campaign, and expansion of the regular Army to about 120 regiments, including artillery and light dragoons, capable of facing the British in open battle. The plan called for an Army of 90,000 officers and men, but since only a small proportion of that number was ever recruited, militiamen remained an important source of reinforcements. That teamwork would prove its worth before the full plan could even begin to be implemented. the American defensive array just as the summer's militia contingents were leaving for home. Howe promptly exploited the situation by driving across New Jersey toward Philadelphia, the American capital. Washington had to retreat all the way to the Pennsylvania side of the Delaware River before Howe called off operations and settled down in winter quarters. Washington knew that he had to end the year on a positive note to encourage recruiting and sustain the will to resist. Using militia reinforcements from Pennsylvania and Delaware, he decided to strike at several isolated garrisons. It was a risky gamble, for defeat would probably bring the Revolution to an end. But Washington won a brilliant victory on 26 December in a snowstorm at Trenton and another on 3 January at Princeton, recovering in one swift and daring operation most of New Jersey. When campaigning resumed in 1777, the logic of British strategy called for their two main armies in Canada and New York, working in unison, to sever New England from the rest of the country. The authorities in London, however, failed to ensure that the two commanders coordinated their operations. For his part, General Howe planned to continue his previous year's effort to break American will by now moving south to capture Philadelphia. He reasoned that this move would cause Washington to follow him with the main Continental force. General John Burgoyne in Canada could then deal with the American garrison at Fort Ticonderoga and drive south to the Hudson River. When events failed to work out this way, the scene was set for a major American victory. Burgoyne's expedition enjoyed immediate success. American engineers had left one key hill mass at Ticonderoga unprotected because they incorrectly assumed that it was impassable for artillery. As soon as Burgoyne's cannoneers placed guns on it, the badly outnumbered Americans under Major General Arthur St. Clair were forced to evacuate the fort. The garrison retreated south until it made contact with General Schuyler's forces in New York. Although St. Clair saved most of his men, the defeat of his rear-guard regiments in several delaying actions and the loss of the fort, which had been a vital defensive position in the colonial era, started a movement in Congress to replace the Northern Department's senior officers. Fort Stanwix stubbornly refused to surrender. Then a relief force of New York militiamen, although defeated in a bloody battle at Oriskany, managed to punish Burgoyne's Indian allies in the region so badly that those valuable auxiliaries began withdrawing their support, eventually forcing the British flanking column to retreat to Niagara. Burgoyne also lost a large foraging force of Germans at Bennington, to Brigadier General John Stark's militiamen, reinforced by a regiment of continentals. By the time Burgoyne began his advance in earnest, work parties of militiamen and continentals had torn up the roads and bridges and had obstructed the creeks and streams stretching south from Lake Champlain.. Schuyler, a veteran of logistical operations in the wilderness during the French and Indian War, had recognized that transportation would be Burgoyne's achilles heel, and that time would be-the Americans' most valuable ally. The successful delaying tactics allowed the movement of additional continentals up from the lower Hudson Valley and the mobilization of masses of militia from New England. Schuyler never benefited from the strategy he devised. 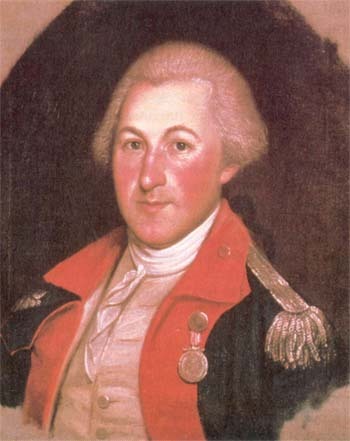 Major General Horatio Gates replaced him as commander of the Northern Department in mid-August. Gates placed his five Continental brigades in an entrenched position on Bemis Heights, near Saratoga, New York, to bar Burgoyne's route to Albany. The masses of militia took up positions outflanking Burgoyne's line of march and threatening his rear. Raiding parties penetrated as far as the outer lines at Ticonderoga, fatally disrupting British supplies. By early September Burgoyne was in an untenable situation. Rather than retreat, he pushed on in the hope of reaching Albany and safety. On 19 September he fought with Gates' men, led in combat by Colonel Daniel Morgan and Major General Benedict Arnold, in the fields and woods in front of the American lines on the heights above. This first battle at Freeman's Farm ended with the British, badly bloodied, stopped cold and forced to dig in. On 7 October, his supply situation now critical, Burgoyne gambled one last time. He sent forward most of his effective troops in a reconnaissance in force, hoping to find a weakness in Gates' fortifications. American skirmishers quickly discovered the British, and once again the continentals led by Morgan and Arnold sallied out to meet the enemy in the woods and scattered fields of Freeman's Farm. They stopped the British, and a wounded Arnold succeeded in leading his men into the outlying British earthworks before the onset of darkness. Burgoyne, incapable of movement in any direction, accepted a conditional surrender. On 17 October "Gentleman Johnny" and his 6,000 troops marched out to lay down their arms at Saratoga, the most stinging defeat suffered to date in America by the Crown. Howe, never anticipating that Burgoyne would run into problems, completed his own planning for the 1777 campaign without any intention of direct coordination with the army in the north. He had selected Philadelphia as his target to help erase the sting of Trenton and Princeton and to eliminate the largest American logistical base. Occupation of the American capital would also serve as an important political victory and allow the Crown to rally the middle states' Loyalists, mistakenly believed to be a substantial proportion of the population. Th avoid the problems encountered in New Jersey in 1776, especially the difficult terrain and the danger implicit in Washington's ability to rally large numbers of militiamen to reinforce his continentals, Howe decided to attack Philadelphia from the sea. The transports and accompanying warships left New York in late July. Howe's original choice was to approach the city by way of the Delaware River, but naval experts quickly convinced him that the forts and American ships based below Philadelphia rendered that route impractical. Instead, he sailed up the Chesapeake Bay and landed at Head of Elk (now Elkton), Maryland, in late August. Washington had been mystified by the illogic of the British movements, believing that Howe's only reasonable plan was to use the Hudson to link with Burgoyne. 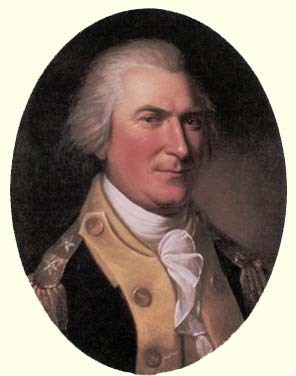 Once Howe's true intentions were confirmed, the American commander set out rapidly for Philadelphia. The continentals concentrated on defending the main route between Head of Elk and the capital while hastily mobilized militia guarded the flanks in Delaware, Maryland, and Pennsylvania. Howe organized a base area to support his operations, and in early September started northeast toward his target. On 11 September he brilliantly outmaneuvered Washington to secure a crossing over Brandywine Creek, the major natural obstacle in the area, although several of Washington's brigades gave a very respectable account of themselves in the afternoon's fighting. Howe, although unable to pursue Washington, occupied Philadelphia on the 27th. Congress managed to escape, and most of the Army's important supplies were saved from the defeat. cate the tactics that brought victory at Trenton and Princeton. During the night of 3-4 October, the Americans, marching in multiple columns, began a twelve-mile approach. According to the plan, the continentals in two bodies would strike at dawn along the two main routes into town while militiamen and small flanking parties would provide deception by simultaneously engaging the extreme ends of the cantonment area. But the long approach march proved to be too difficult for the troops to execute with precision, and the columns struck piecemeal. The vanguards of both Continental columns enjoyed initial success, overrunning the camps of Howe's elite light infantry battalions, even penetrating into the village of Germantown. Alert action by the commander of the 40th Foot, however, enabled six of his companies to occupy the Chew House, a stone structure that commanded one of the roads. Washington's advancing columns began to flag, their commanders confused in the fog and musket smoke that had begun to hang over the battlefield. Meanwhile Howe stabilized his lines, brought up reinforcements, and counterattacked. His units cut off the 9th Virginia Regiment inside Germantown and took most of its men prisoners. Several American units mistook each other for enemy and opened fire, throwing both columns into further confusion. Finally, although the leading American brigades had bypassed the Chew House, the reserve units became preoccupied in a futile attempt to storm the structure and, consequently, were not on hand to help keep the American advance moving. Washington reluctantly concluded that prolonging the attack was too risky and ordered a withdrawal. Howe, shaken by the close call, made only a halfhearted attempt at pursuit (easily checked by a rear guard under Maryland's Lieutenant Colonel John Eager Howard) before settling back down to the long, hard job of clearing the river of American forces. General Frederick von Steuben for use by both the continentals and militia. Steuben displayed a genius for developing a simple and efficient system for maneuvering on the battlefield that drew on many American and European precedents. The result, published in 1779 as Regulations for the Order and Discipline of the Troops of the United States, Part I, became the first official Continental Army field manual, and was distributed to the militia as well as the regulars. The effort to provide similar training to both militia and regulars, however, implied no change in the strategic use of the militia. The fundamental commitment to a policy of blending the separate talents and skills of regulars and citizen-soldiers remained the same. A measure of American success in 1777 was the fact that France decided the following February to enter into an alliance against Britain. The war in America eventually assumed even larger global implications as first Spain and then the Netherlands also declared war on their old enemy. The addition of traditional European adversaries into the war forced Britain in turn to change its strategy. New requirements for ships and men to protect possessions in Europe, Africa, Asia, and the Caribbean turned North America into a secondary theater. With resources limited, Sir Henry Clinton, who replaced Howe as the British commander in May 1778, received orders to develop a new strategy. He began by evacuating Philadelphia, just in time to avoid being trapped by a French fleet sent to work with Washington. Washington's continentals; and New Jersey militiamen caught up with the British rear guard at Monmouth, but the resulting battle ended in a draw and the British escaped. Action then shifted to the British outpost at Newport, Rhode Island, where large contingents of New England militia turned out to assist continentals and the French fleet in besieging the town. The operation ended prematurely when damage from a storm and an inconclusive sea battle caused the French to withdraw and left the British still in control of this northern outpost. Clinton used this reprieve to implement a new "southern strategy." He consolidated a defensive position in New York where a portion of his army could tie down Washington's main force. Orders went to Canada to use Indians and Loyalists to raid the frontiers of Virginia, Pennsylvania, and New York in an effort to force Congress to divert regiments to protect those regions. The rest of the British troops were to be used in the south to defeat local Continental forces and disperse the militia. At that point the Loyalists, whose numbers the Crown still grossly overestimated, would be formed into units and used to secure the newly regained area. The British regulars could then move north against the next state and repeat the process. On 23 December 1778 Savannah fell to an invading force from New York and Florida. The following year a Franco-American counterattack, supported by militia units from Georgia and South Carolina, ended in a bloody fiasco�a Bunker Hill in reverse. Clinton then mounted another invasion, this time aimed at Charleston, South Carolina. On 12 May 1780, after a 42-day siege and gallant defense, Major General Benjamin Lincoln's 5,000 continentals and militia were forced to surrender in America's worst defeat in the war. A second disaster of colossal proportions followed almost at once. A crack division of Maryland and Delaware continentals marched south to serve as a nucleus for a new field army. Congress sent Gates to take command, assuming that he would repeat his Saratoga success by rallying the militia to augment his regulars. Gates impetuously called out a large force and launched an offensive without rebuilding his army's supply system. On 16 August 1780 near Camden, South Carolina, his troops collided with General Charles Cornwallis, now the senior British officer in the south. Gates placed all of his militia on the left flank, his continentals; on the right. The two wings promptly lost sight of each other in the smoke of battle. Cornwallis routed the militia, who were unfamiliar with linear combat, then wheeled on the continentals and shattered them. For the second time in a matter of months the Southern Department found itself without a field army. By the end of the year, however, American fortunes shifted again. Major General Nathanael Greene, who had replaced Gates, emerged as a first-rate strategist. He used irregular Patriot units in Georgia and the Carolinas, many under former continentals like Francis Marion and Thomas Sumter, to harass British rear areas, forcing the enemy to shift attention further north in an effort to cut supply lines sustaining the partisans' operations. Cornwallis marched his main body through the more populous low country while light forces covered the interior. Unfortunately for the Crown, the flanking parties ran into immediate trouble at the hands of backcountry militiamen, most notably on 7 October, when a force of 900 frontiersmen captured the Loyalist units screening Cornwallis' left flank at King's Mountain, South Carolina. Cornwallis soon suffered a much more devastating blow. Contrary to conventional wisdom, Greene did not keep his outnumbered force concentrated. He recognized that local militia, if supported by continentals, could inflict considerable damage on the vulnerable British rear. Exploiting the opening created by King's Mountain, Greene concentrated his light troops, both infantry and dragoons, under Daniel Morgan, now a brigadier general. From a vantage point well inland from the Southern Department's main body, Morgan could slip behind Cornwallis, rally militiamen, and begin offensive operations against British supply trains and bases. Cornwallis, on the other hand, was determined to push the main Continental force back in order to gain time to pacify South Carolina. At the same time, he concentrated his remaining light troops under his best junior leader, Lieutenant Colonel Banastre Tarleton. They were ordered inland to neutralize the threat to his flank by finding and crushing Morgan. On the evening of 16 January 1781 Tarleton began closing in on his quarry, who had halted at Cowpens, South Carolina. from the Carolinas and Georgia to form a line about 150 yards in front of the continentals, and a smaller skirmish line another 150 yards further forward. Morgan's military genius was revealed in this use of his militia. Realizing that they lacked the training to stand and slug it out with the Redcoats, Morgan told them merely to wait for the enemy to get in range, fire two well-aimed shots per man, and then retreat. He was able to instill confidence by his homespun style of leadership and by taking time to visit each small group before the battle began. By telling the militia in advance that retreat was expected, he avoided the danger of panic and rout. He positioned them in such a way that the effect of their fire would disrupt Tarleton's advance and force him to commit his reserves before his troops closed with the main line of continentals. On 17 January the trap was sprung. Tired British and Loyalist soldiers reached Cowpens and were quickly ordered into a line, supported by two small field guns. As they advanced, the American skirmish line fired its two volleys and withdrew, as did the second line of militia. The casualties they inflicted, and the sudden shift in their lines, led Tarleton, as Morgan had predicted, to commit his reserves. The British continued their advance, confident of victory because they had so easily swept the first two American elements from the battlefield. But there was to be no duplication of Camden. The British ground to a halt when they collided with Howard's regulars. Tarleton committed his cavalry on the flank in an effort to turn the American line, but it was driven back by the Continental dragoons in heavy hand-to-hand fighting. Howard, meanwhile, slowly retreated, drawing the British infantry forward and increasing their disarray. As soon as he judged the confusion sufficient, Howard ordered his veterans to counterattack with bayonets. The shock of the sudden charge, coupled with the reappearance of the American militiamen on the flanks where Tarleton's exhausted men expected to see their own cavalry, proved too much. The British line collapsed, and Morgan's men took over 600 prisoners, overran the two artillery pieces, and captured Tarleton's wagon train. In less than an hour, Cornwallis' light infantry, some of his best soldiers, had been lost. Cornwallis immediately attempted to counteract the Cowpens defeat by chasing Greene all the way to Virginia. The British became so exhausted by this futile effort that they had to withdraw to the coast, where Cornwallis could establish a base and refit his regiments. Greene then seized the initiative. By concentrating on quality and mobility, he turned the small size of his army into a logistical advantage. Large militia contingents were called out only on the eve of a battle and used as they had been at Cowpens. Greene began his offensive with a battle at Guilford Court House, North Carolina, on 15 March 1781. North Carolina and Virginia militia brigades opened the engagement by delaying and disrupting the British advance. The continentals then punished Cornwallis' regiments with accurate musket fire and a bayonet charge, and when Greene began to lose control, he carefully broke off the action, knowing that as long as his main body remained intact, the British could never disperse to deal with the irregulars. By September a repetition of these tactics, coordinated with attacks on depots and outposts, left the British isolated in Charleston and Savannah. Meanwhile, Washington's main army in the north had been reinforced by a division of French troops under Lieutenant General le comte de Rochambeau in the summer of 1780. Washington immediately began planning a joint land-sea assault on New York City. A victory against this British stronghold, he reasoned, would have a decisive impact on the war, depriving the enemy of his major naval base and breaking the will of the English people to support further hostilities. The French, however, were reluctant to strike against the heavily defended British position. Washington was forced to abandon his plan, and he spent the year inconclusively in a wide defensive arc around the city. By the summer of 1781 Cornwallis had moved into Virginia in an effort to cut Greene off from reinforcements and supplies. This tactic failed to achieve the desired results, as continentals under Major General le marquis de Lafayette and Brigadier General Anthony Wayne, reinforced by Virginia militiamen, prevented the British from permanently occupying any important inland city. General Clinton finally ordered Cornwallis to terminate his offensive operations and find a site for a naval base on the Chesapeake Bay. Ships operating from such a base, under the protection of a reasonably small garrison, could effectively disrupt the American tobacco trade, the primary source of the Continental Congress' hard currency. Cornwallis was then to send the rest of his men to reinforce New York. On 1 August, on the advice of naval and engineer experts, he selected Yorktown, Virginia, as his base. Washington's plan for the 1781 campaign again depended on the cooperation of the French for an attack on New York City. In early July, in anticipation of that event, Rochambeau's troops moved to the vicinity of New York City from their winter quarters in Rhode Island, and the allied staffs began reconnoitering the approaches to Manhattan. In mid-August dispatches arrived from Admiral le comte de Grasse, however, announcing that he did not wish to risk his warships at New York and that his fleet would sail instead to the Chesapeake, bringing a force of French troops with him from Santo Domingo. their plans. Instead of striking at Clinton, they now decided to capture Cornwallis. On 20 August they led the vanguard of an allied army across the Hudson on a rapid march south, covered by an elaborate deception plan to lull Clinton. Six days later de Grasse's ships entered the Chesapeake and on 2 September began landing French troops near Williamsburg to join forces with Lafayette and Wayne. A British relief force engaged de Grasses ships three days later off the Virginia Capes, but was unable to break through to Cornwallis. Its retreat to New York sealed any chance the British at Yorktown had of escaping by sea. On 14 September Washington and Rochambeau arrived at Williamsburg, joined over the following days by their regiments. The consolidated force, with a logistical base firmly established at Williamsburg and with the French fleet in control of the Chesapeake, set out on 28 September to bring Cornwallis to battle. Militiamen, reinforced by French light troops, blocked any retreat across the York River at Gloucester. The main body forced Cornwallis' outposts to withdraw and on the night of 30 September began digging the trenches for a formal European-style siege of Yorktown. Morale among the allies soared, the two contingents engaging in competitions to demonstrate which was more efficient and professional. As the siege progressed, heavy guns were moved ever closer to the defenders' earthworks. Two isolated outworks, known as Redoubts 9 and 10, presented the last obstacle. On 14 October, Washington ordered a night bayonet attack to capture them. Elite French troops under le vicomte de Noailles, Lafayette's brother-in-law, were assigned Redoubt 9; Lafayette's light infantrymen under Lieutenant Colonel Alexander Hamilton were to assault Redoubt 10. Each attacking column marched with unloaded muskets to prevent accidental discovery. Number 10 fell after a quarter of an hour's fighting; Number 9, a few minutes later. Engineers immediately began incorporating the positions into the allied siege lines, and a few days later, as heavy guns pounded his final positions, Cornwallis was forced to ask for terms. The surrender took place on 19 October amid pomp and circumstance. Although no one realized it at the time, Yorktown would be the last major battle of the war. On 19 April 1783, eight years to the day after the first shots at Lexington, an armistice halted the fighting. Almost immediately Congress began disbanding the Continental Army. The Treaty of Paris ending the war and recognizing American independence followed on 3 September. Washington returned his commission as Commander in Chief to the nation's civilian leaders, then meeting in Annapolis, Maryland, on 23 December; the soldiers of his last regiment received their discharges at West Point, New York, on 20 June 1784. America's victory surprised many European observers. Some attributed it to the effect of the frontier; others, to British blunders. Actually, a key factor in the victory came from the successful innovations Washington and his generals made in the traditional colonial approach to warfare. The Americans created a unique mix of militia and regulars, each with clearly defined functions, and employed a conservative defensive strategy combined with selective offensive blows against targets created by British mistakes. The militia served as the enforcement arm of Revolutionary government and carried out the traditional function of local defense with renewed vigor. In essence, the existence of the militia restricted British authority to those areas physically occupied by Royal troops. The continentals, improving on the Provincial model of, earlier wars, performed missions requiring a main battle force able to operate for extended periods and in any geographical location. Their strengths, particularly their offensive capabilities, complemented the militia's and prevented British commanders from dispersing their troops to crush local resistance. Achieving these results was not a simple task. Politicians frequently bristled over any hint of challenge to their authority, while military leaders grumbled about inefficient civilian administration and critical deficiencies in logistical support. In fact, there was little military threat to congressional authority. Even in the two most celebrated cases of unrest, the mutinies in 1781 by enlisted men from Pennsylvania and New Jersey and an officers' protest in 1783 known as the Newburgh Conspiracy, the continentals accepted the ultimate authority of Congress and the state governments. In the end, it was not any challenge to congressional authority that threatened the Revolution, but rather the weakness of the central government. Washington and his staff faced almost insurmountable difficulties in the day-to-day conduct of the war because of the frustrations involved in dealing with an ineffectual Congress. Washington's personal example of unparalleled devotion to duty clearly played a critical role in victory. To most Americans he, rather than the Continental Congress, became the symbol of the Revolution. He took great pains constantly to remind the soldiers that they were engaged in a common struggle for liberty, and he used his officers, especially chaplains like Abraham Baldwin of Connecticut, to turn the Army into a school devoted to the civic obligations of the American citizen-soldier. Military service, either in a contingent of mobilized militia or as a regular in the Continental Army, thus became an important formative influence on men from every state. By serving side by side, they came to understand that a unified country had greater potential and strength than any single state or loose confederation of states, and many came to identify themselves first as Americans and as Virginians or New Yorkers only in a secondary sense. Washington and his fellow military leaders also formed ties of mutual respect and friendship with the politicians who supported them in Congress and in the state governments�ties that would survive the war. When these citizen-soldiers of the Revolution returned to civilian life, they did so as experienced leaders, confident about assuming new duties in their communities and eager to build a new nation.